Over the centuries, thirteen mills have been powered by the river Dour. Eight of the Dour's mills were corn mills, with the site at Charton also being used as an oil mill. The remaining five mills were paper mills, which needed the Dour's pure water for manufacture processes as well as power. A number of mills on the Dour were recorded in the Domesday Book, a record made by the Normans, in 1086AD, of all taxable land and property following their conquest of England in 1066AD. From the Dour's source heading downstream, "Domesday mills" included Kearsney Court mill in Temple Ewell, Crabble corn mill, Lower Buckland Mill and Charlton Flour Mill, Other ancient mills were recorded in at Brox-Ditch Meadow, today the area around Lorne Road and Alfred Road, and at Charlton. Priory Mill, sanctioned by the church, was listed in the Domesday Book, together a description of a tide mill connected with the Priory that was already demolished before the Norman conquest. This may have been due to the damage it was said to have casued to shipping. Historians and archealogists have long debated about its exact position. The Town Flour mill, near Dolphin Passage and close to the modern seafront, was also recorded in the Domesday Book but was not as old as those upstream , having only been built since the Norman Conquest by Herbert, Son of Ivo. Temple Ewell Mill was built by St John's Commandery to supply its troops. In 1798 it was bought by the Pilcher family to help to supply Napoleanic troops. Maison Dieu Mill, on the site of the bridge behind Maison Dieu House (the Town Council Offices) was built by John Payntour in 1540 to provide flour to Victualling Store in the Maison Dieu (Dover Town Hall)which supplied food and drink to the Navy. In 1590 two mills at the site are recorded - one for wheat and one for malt, which would have supplied the brewery in the Maison Dieu. The Maison Dieu mills dissapear from the records in the 1700s. 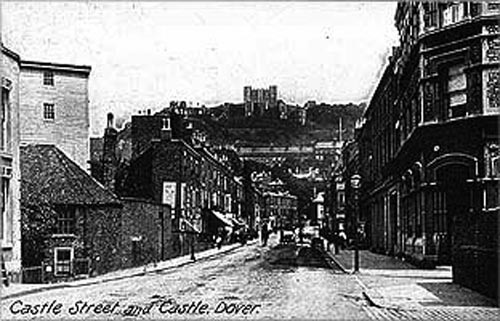 The Napoleonic wars from 1803 - 1815 made milling a very profitable business in Dover. Feeding the vast numbers of troops stationed in the town required greatly increased production of flour and the maison Dieu was used to bake bread for the soldiers. Stembrook Mill was built in 1799 by the Royal Navy to help to mill enough flour. Today the site is occupied by a carpet shop on the corner of Castle Street and Stembrook. It was probably built on the site of a mill known to be there in the 1780s, and may have been rebuilt again in 1813. The river now runs into a culvert at this point and the former location of the mill can be seen by railings over the culvert entrance. The opportunity for quick profits during the Napoeonic Wars led several milling families to take out substantial bank loans to begin or expand their businesses. Following victory at Waterloo, the end of demand for military supplies and an unstable national economy made times very hard for Dover's miilers. iliam Kingsford bought Bucklamd Corn Mill in 1814 and built the fine Lundy House next door. He expanded his business by buyong Charlton Mill around 1820, but tried to sell it again withing the decade, finally selling it to Joseph Bell. Despite considerable modernisation of the mill, Bell had little sucess with it. Kingston purchased Maison Dieu Hoause in 1833, but must have been overconfident of his sucess as he was declared bankrupt the same year. Unreliable harvests in the late 1830s, coupled with a ban on imported grain and the collapse of a Dover bank all played their part in the ruin of the Pilcher family, who had previously been the sucessfull ownner and managers of several of Dover's mills. Their demise was the making of the Mannering and Stanley families. The Mannerings bought the Picher's former mill at Crabble from the Fector bank, beginning a successful milling business that continued through the generations until their last mill, Buckland mill, ceased operations in 1957. The Pilcher's Temple Ewell mill was first bought from the bank by Mr Martin, who became bankrupt. Alfred Stanley, already running a sucessful mill at Keasney, then bought it for £100, later building a second steam mill to the Kersney Mill specifications on the opposite Side of the Road. The Stanley family moved all of their business to Temple Ewell and retained ownership of the mills, The Temple Ewell mill steam was the last mill on the Dour to cease commercial trading in 1967, and is now the Dover Operatic and Dramatic Societies costume store. The watermill opposite was partly demolished, loosing some of its buldings and mill wheel cover, but still stands as a private house. Today only the restored Crabble Corn Mill, now owned by a trust, still grinds corn on the Dour. Crabble corn mill escaped modernisation to steam power or conversion to housing or other uses because it was replaced, then used as a warehouse by its owners. The mill's machinery was not removed, and so has survived in working order to the present day. The mill still grinds corn, which can be bought in its shop. Self guided tours are availble and the mill also welcomes groups for guided tours. 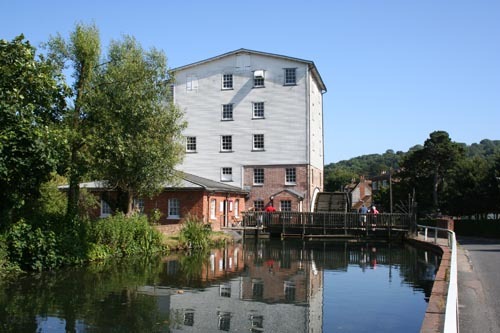 Festivals and community events are held at the mill in support of the Crabble Corn Mill Trust, and a cafe offers refeshments as well as fine views of wildlife on the mill pond. The most well known of Dover's millers are the Picher and Mannering families. In 1783 John Webb is recorded as having erected a smock mill (windmill) in Margate. By in 1801 he had married into the Pilcher family and built further windmills. John Webb Pilcher is known to have owned a small mill at Crabble near Dover in 1812. A watermill would have offered more efficient milling and he is likely to have bought the site for its millponds and position as he then built a large modern mill beside the old one to take advantage of the demand for flour for the troops. Crabble Corn Mill was a huge grain processing machine - an automated mill based on american ideas which required few workers. After the Napoleonic wars ended The Pilcher family bought up mills that were in financial trouble due to the change in demand. It is also thought that they may have opened a steam mill near the harbour. Although an improving economy for while brought profits from processing grain and shipping it to London by sea, the Pilcher's business is likely to have suffered from the supply problems caused by poor harvests and grain import bans. In 1838 the deeds of Temple Ewell Mil, Crabble Mill and Town Mill were transferred to the Fector Bank with which they had considerable borrowing, but trade did not improve and Fector declared them bankrupt. The Pilchers had also borrowed from Dover's Latham Bank for Buckland Corn Mill, where they were able to continue milling operations, however Lathams collapsed in 1846, spelling the end of the Pilcher family's business - a paricular blow for John who had been an important local politician for many years, and elected Dover Mayor in 1823. Two generations of Mannering millers transformed corn milling on the Dour. Willsher Mannering senior bought the Town Mill from Fectors bank in 1836. This young miller leased Crabble MIll from Fectors then bought in 1845, having then been joined in business by his brother John. They demolished the old mill, improving the new automated building by adding two extra pairs of stones, giving five pairs in all. The Mannerings could see the potential of sales of flour in London, with cheap transport by sea from Dover harbour, and for a while this made Crabble Mill a sucessful business in a thriving town. Technology and a lifting of the ban on imported grain, however changed the viability of water milling with stones. Steam driven Rollermills were being built in London and other sea ports, The Mannerings built a new steam mill at the Buckland Mill site, and converted it for Rollermilling around 1882. Willsher Mannering junior and his brother Edward introduced many other innovations to milling such as the use of silk to sift the flour from the grain husks, giving a whiter, more fashionable product. The Mannerings last working mill at Buckland ceased work in 1957 and is now converted to residential units.